Families, teachers, staff members, and students in grades 3-8 will complete surveys. Results will be shared with principals, school staffs, parent leadership groups, our Superintendent Dr. Harmeier, and the Board of Trustees. As always, your responses are anonymous. This year, we hope to hear from more than 40% of our families district-wide. When you receive the email from Panorama Education next week, please take a few minutes to complete the survey. We want to know how you think we’re doing! We did it! Thanks to all of you, we met our fundraising goal for our playground. In just a few short weeks, our new playground will be installed! During the playground demo and install, our tile artist, Barbara, will begin installing our new tile wall. She is looking for a few people to help with the installation. If you enjoy this type of work or would like to bring lunch to the volunteers working over Presidents’ Week, please sign up here. Feel free to sign up for one shift or all day. 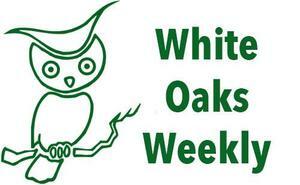 Every year, for the past several decades, White Oaks celebrates Founders' Day. This time honored tradition has become such a special event at White Oaks that helps us recognize and thank those volunteers in our community who have gone above and beyond. We need your help in nominating some of these very special people. Please usethis link to review the awards given and to submit your nominations before February 25, 2019. On Wednesday, April 17 we will hold our annual PTA Founders' Day event to celebrate and recognize the contributions of our award winners. Please mark our calendars for this special event! Please join us for our upcoming PTA meeting this Wednesday morning in the MU. We'll hear an update on our playground installation and mosaic tile wall and discuss upcoming events. The full agenda will be posted outside the front office on Monday morning. All are welcome! Registration for the School Play is OPEN! It’s finally here! It's time for all students interested in participating in the school play to register. Produced in collaboration with the White Oaks PTA and San Carlos Children's Theater (SCCT), this year's production will be Disney’s The Lion King Kids. 2nd and 3rd graders may register to be in the main cast of 45 participants (grades 2/3 only). K through 3rd grade students can register to take part in the chorus (grades K-3). Rehearsals begin March 6 and performances will be on April 26th and 27th. Register here through the San Carlos Children’s Theater site. If registration is oversubscribed a lottery will be held to determine participants. Any student who does not get a place through the lottery will have their full registration fees refunded. Scholarships are available. Contact Donna at sancarloschildrenstheater@gmail.com for more information. Please sign up as soon as possible! Please join Dr. Aaron Nayfack, Developmental Pediatrician, and SCSD Preschool Director, Sue Dawley for an interactive presentation about health and media use in early childhood. We understand that our "digital natives" pose new questions for us as parents, and we aim to share best practices, current research, and hands-on toolkits to build healthy brains. The City of San Carlos is starting the process of developing a Bicycle & Pedestrian Master Plan and they need our input, especially because our SCSD students will be impacted by this plan. Please check out this website for more informationwww.cityofsancarlos.org/bikepedmasterplan, including a survey, and make sure to share it with friends and neighbors. Bid NOW and keep checking back to WIN your items! It is a fabulous night of dinner and dancing with live and silent auctions. Have family and friends who would like a chance to win one of our spectacular Gala auction items? Purchase a Lucky on Live raffle ticket. The lucky winner will choose from a selection of Starlight Gala live auction items. This year’s offerings include: Your own parking space downtown, Stellar Cellar collection, Mexico Vacation, French Laundry Dinner, Dinner for 20 in the TOWN boardroom, or tickets to the Emmys or American Music Awards. To see all eligible items go to: http://www.scefkids.org/LOL2019. Only 275 tickets will be sold. If you would like to purchase raffle tickets send an email toluckyonlive@scefkids.org. Tickets are $100 each or 6 for $500. Join Healthy Cities Tutoring for the 5th annual Perfect Pairings benefit wine pairing dinner on Friday, March 1 from 5:30pm - 9:00pm at Domenico Winery, 1697 Industrial Road in San Carlos. The Perfect Pairings benefit will be a festive celebration with delicious food and wine pairings, special friends and inspiring stories. Our community of supporters will enjoy passed appetizers and prosecco followed by a delicious 3-course sit-down dinner prepared by Chef Gino Gramegna and perfectly paired wines from Domenico while helping to make a difference in the lives of children. Please purchase your tickets by Feb. 19 at Perfect Pairings. Contact Cris Adair (cadair@healthycitiestutoring.org) with questions. Thank you!